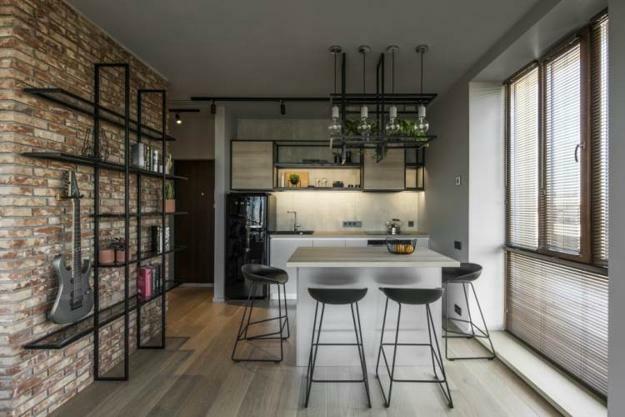 Exposed brick wall, wooden floors, concrete, painted black metal, and glass create a calming background for adding color accents and spicing up black and white apartment ideas. The neutral color scheme is ideal for personalizing an interior design with colorful details and green houseplants. 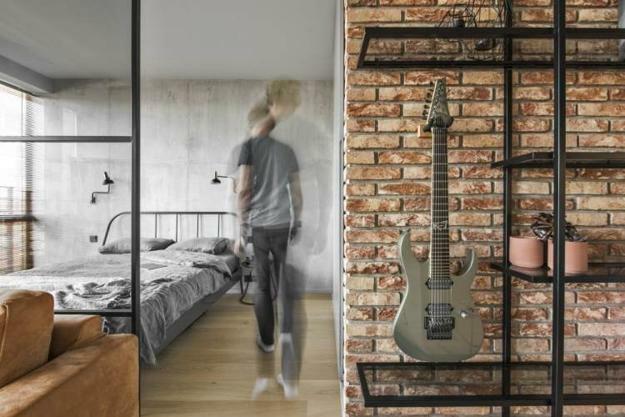 The small studio apartment is in the center of the Lithuanian capital, Vilnius. 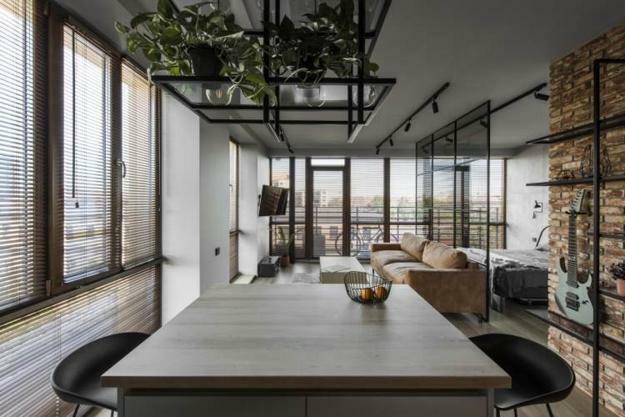 The modern home interiors are the design by Egle Misinyte and Jurgita Mockute. 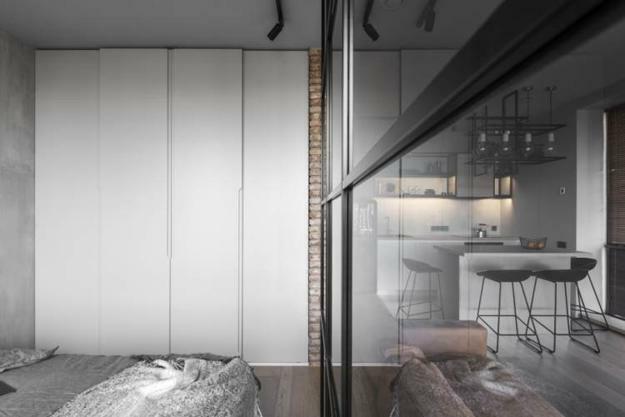 The Me2architects project created 47 square meters of stylish and comfortable living spaces offering everything necessary for a modern lifestyle. 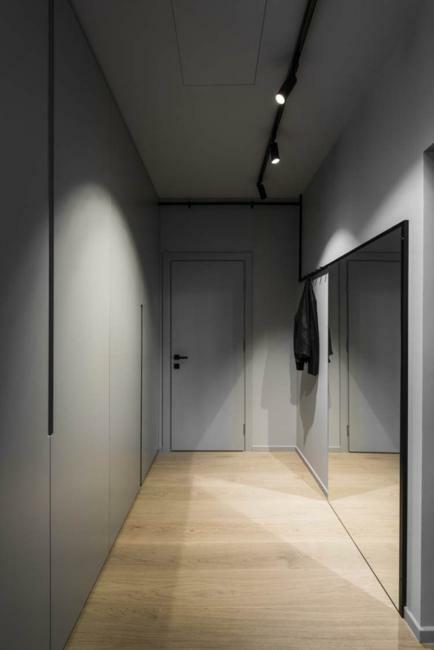 Loft living style emphasizes comfort and functionality, using unique features to give an elegant touch to the modern interior design. 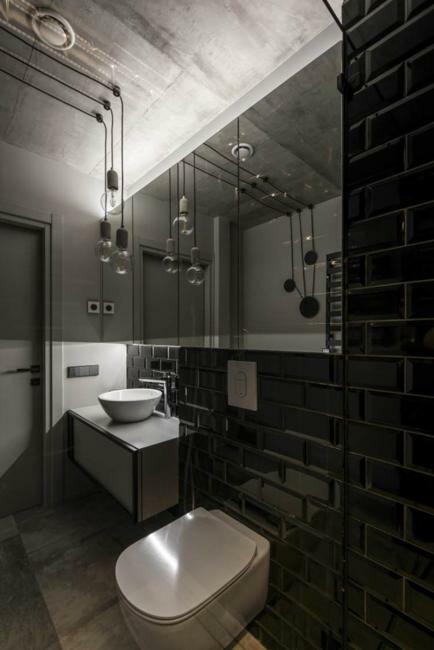 The natural textures and monochrome interior design color schemes feel quiet and calm. Soft-yellow sofa, wood flooring, and pastel colors of planters and bricks add warmth to neutral apartment ideas and brighten up gray color tones. 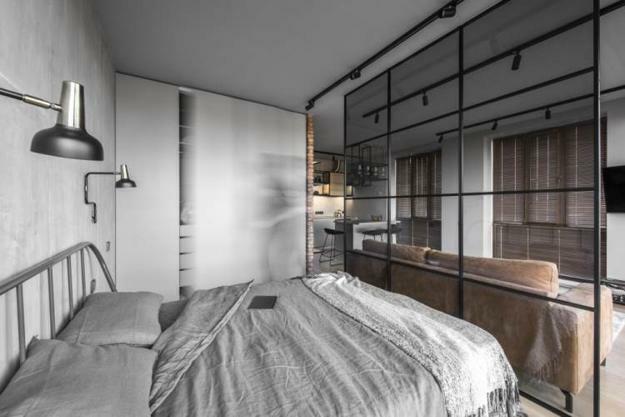 A glass wall is an excellent room divider for small spaces. 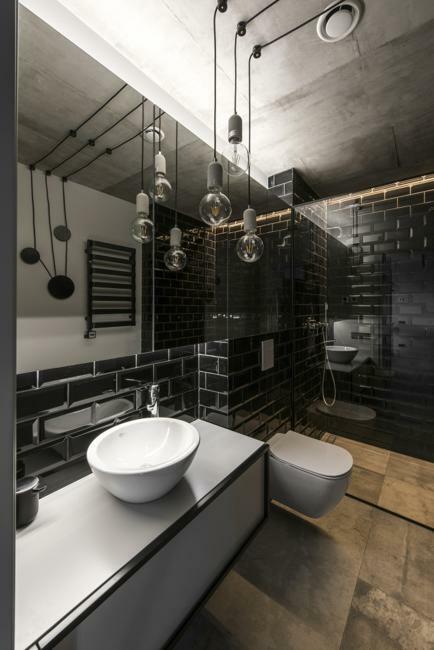 Glass keeps small rooms feel spacious and bright penetrating the living spaces with light and bringing a contemporary vibe to modern interior design. The dwelling is inviting and stylish. 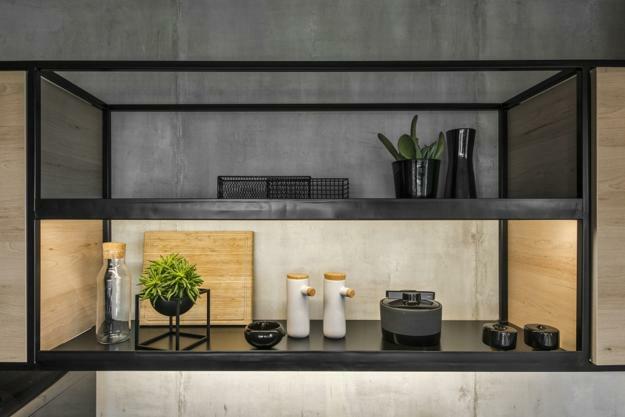 Blending a comfortable feel and a modern look the home interiors are perfect for a single guy. 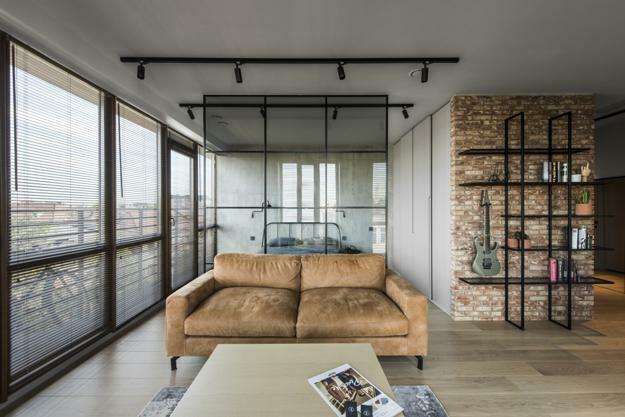 The interior design and ideas for decorating the small apartment incorporate elements of the industrial style creating a connection with urban surroundings. 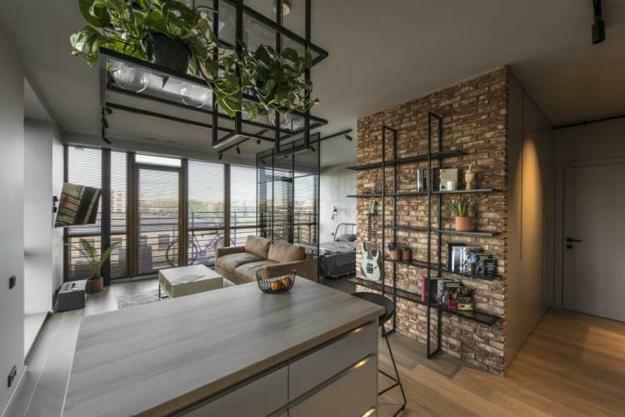 The simplicity of natural materials, such as metal, concrete, bricks, and warmth of natural wood come together to balance the interior design. 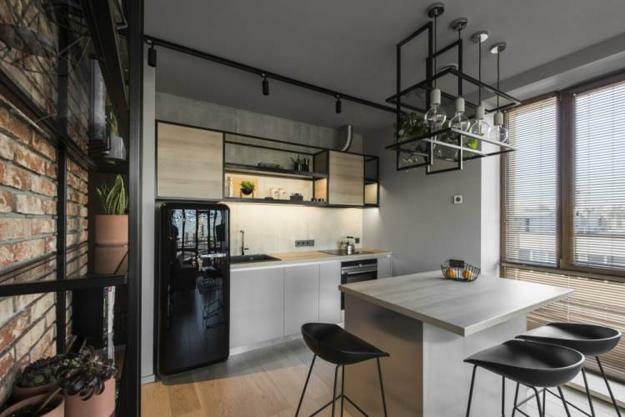 Parquet flooring, wooden blinds, kitchen cabinets, and houseplants soften rough textures, brighten up the neutral color scheme, and add welcoming warmth to the small spaces.